Research conducted by Lee Hecht Harrison revealed that 81% of organizations actively practicing talent mobilization (“committed talent mobilizers”) experience “on or above target revenue growth compared to 68% of other organizations." 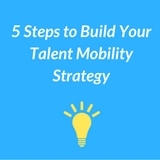 Talent mobility enables organizations to more organically, quickly, and proactively move employees around the organization, vertically and horizontally, to ensure individual skills, talents, and competencies are when and where they are most needed. And it isn’t a one-sided endeavor. It serves to harness existing employee goals, competencies, and passions and matches these more effectively with opportunities in the organization. It’s a truly symbiotic act that benefits both organizations and employees.